Please be advised that daytime mechanical street sweeping will resume in scheduled, signed residential neighborhoods on Monday, March 23, 2009. Alternate-side parking restrictions in these areas will go into effect as well. Parking tickets, which carry a $30 fine, will be issued, beginning March 30, to vehicles parked during street sweeping hours in areas posted with “No Parking/Street Cleaning” signs. Beginning March 30, parked cars also may be towed to allow the sweepers access to the curbside. Generally, parking is prohibited for two hours while sweeping is underway. ANC 2F/Logan Circle meets monthly at the Washington Plaza Hotel. From ANC 2F/Logan Circle… the March meeting is this Wednesday, March 4 at 7 p.m. at the Washington Plaza Hotel, 10 Thomas Circle NW. Agenda below. Remember that East Borderstan (east of 15th Street NW) is part of ANC 2F and Police Service Area (PSA) 307. At each meeting, PSA 307 provides a crime report. If you read this blog, you know that Greater Greater Washington is one of my favorite blogs. Yes, it’s wonky (that’s its purpose after all), but founder David Alpert and his team do a great job at providing intelligent and analytical pieces dealing with urban issues and metro planning. And, no, I do not read every article from top to bottom. I pick and choose. Do not be intimidated by some of the postings–they can feel a bit intimidating if they’re on topics about which you don’t know the details. So, if you follow GGW, you will like this piece on Alpert and GGW at “The Blogger Beat” at Washingtonian.com. What is the economists tell us? Americans need to stop spending so much and save more? But, if we all do it at the same time… in the middle of a bad recession, it only makes things worse? Well, whatever. Lupe and I just got back from the Shaw Dog Park at 11th and R NW. Dogs are great entertainment–and almost free if you don’t count the ownership expenses. Got this from Alert DC this afternoon… there was a robbery-hold up, with gun, around noon on the 1400-block of 14th Street NW, apparently of a business. This would be on the block south of P Street NW. Info is below. You can sign up for DC Alerts online. 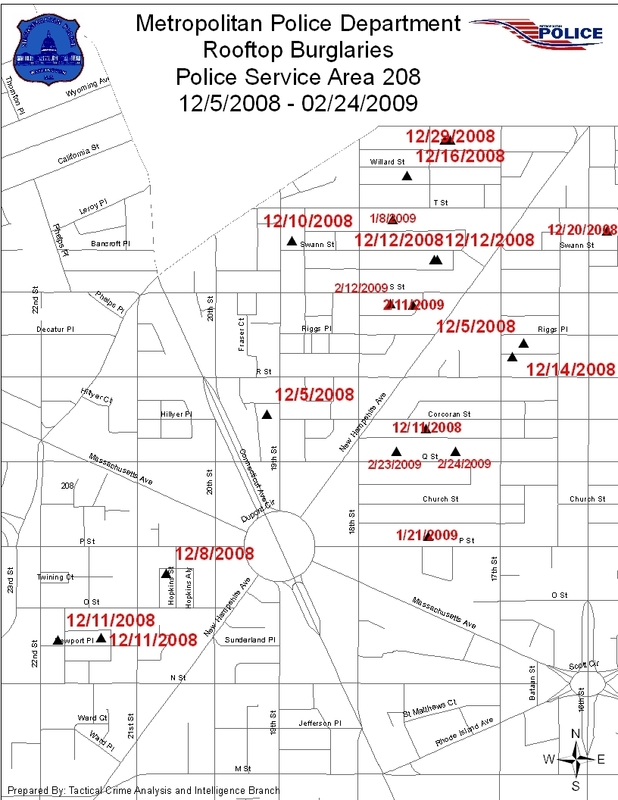 Borderstanians: I received the following news release and accompanying map from MPD Police Service Area (PSA) 208, regarding the recent string of rooftop burglaries in the Dupont Circle area in the 1700 blocks of P, Q, S and T Streets NW. (Washington, DC) — The Metropolitan Police Department is seeking the public’s assistance in identifying and locating the person or persons responsible for a series of residential burglaries committed in Patrol Service Area (PSA) 208 of the Second District. Laptop computers, cameras, small electronics, jewelry, and other easily transportable objects are the items of choice. You may be ready for spring, but is your garden? The final weeks of winter offer the last chance to clear away the remnants of last year’s garden before new growth sprouts. MONDAY: Mayor Fenty at DCCA Mtg. Borderstanians: The following information on securing rooftop hatches and skylights, and fire escapes is from Police Service Area (PSA) 208. The following information is also in a PDF, which includes illustrations. Disclaimer from PSA 208: The following information was collected via open sources for educational purposes only. The information, as seen below, is intended to provide suggestions concerning the following subject matter. Any portion whether in part or whole is not intended to supplement a professional’s opinion or advice on the following subject matter. stuff to do in our hood? Nothing. But how can you not want to know about a whistling orangutan at the National Zoo? With video, naturally. Two great postings today at Greater Greater Washington… one on the plans for the Whitman-Walker property on 14th Street NW between S and Swann NW… and the other on DDOT’s traffic flow plans for 15th Street NW (Borderstan postings here and here). 1700-Block of Q Street: Another Rooftop Burglary? Borderstanians: A Police alert from late this afternoon. You may have heard the sad news that Pulp owner Ron Henderson died Feb. 15. Pulp, for those of you who don’t know, is a gift store at 1803 14th Street NW. Henderson was living in Provincetown, Mass., where he had another store. According to dcist, there is a memorial planned for Henderson.